When we were practicing for Sprecher Brewery’s Grilling With Beef contest, we came up with a few different burger recipes. We’re revisiting these recipes as we plan for the Brewer’s Concession Challenge. Basically, fans are able to submit recipes for a new concession stand item. We’re planning to submit one salad item, one dessert item, and one carnivore option. As we prepare recipes and try different menu options, please try this recipe that combines beef, coffee, beer, and joy…all in one hand-held meal. Saute onion and garlic in olive oil. When soft, stir in remaining sauce ingredients and bring to a boil. Reduce heat, simmer uncovered 35-45 minutes. Mix burger ingredients together in bowl. Form into 3-4 patties. At this point you can refrigerate sauce and burgers until you need them. Fry burgers in pan or grill until cooked as desired (we suggest slightly pink inside and nicely browned outside). Top with BBQ sauce. Note: this recipe makes quite a bit of sauce so you may want to double or even triple the burger recipe. Or you can save the sauce in your refrigerator for all of your BBQ needs. 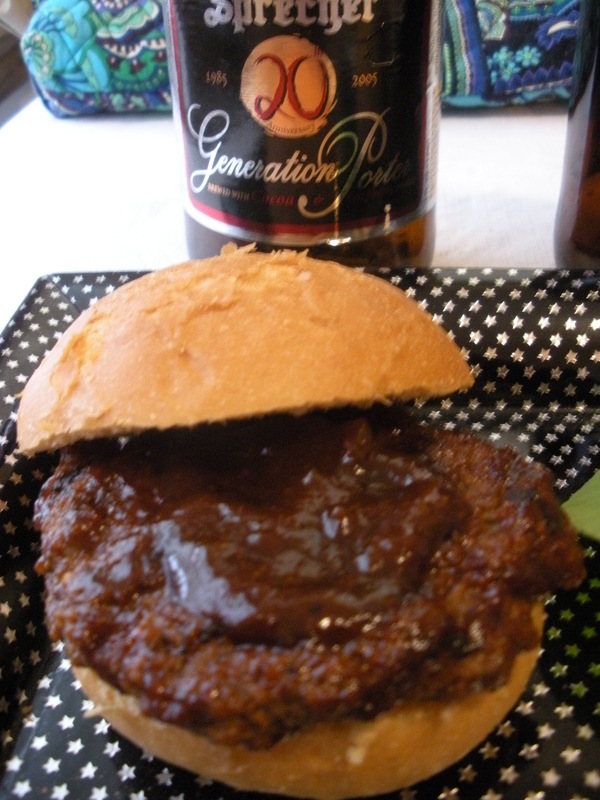 This entry was posted in Beef, Main Dishes, Sauces and tagged Alterra Coffee, Generation Porter, Sprecher Brewery. Bookmark the permalink.